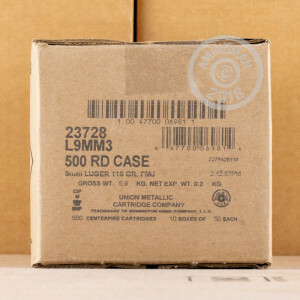 This case of 500 rounds of 9mm Luger ammunition from Remington UMC is a great value for the range. 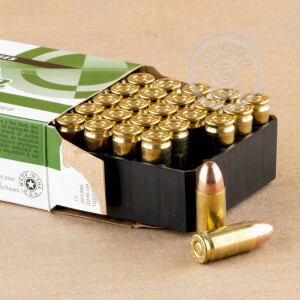 These cartridges come in boxes of 50 (with 10 boxes in the case) and fire light 115 grain full metal jacket (referred to as metal case by Remington) bullets at an above average muzzle velocity of 1,145 feet per second. 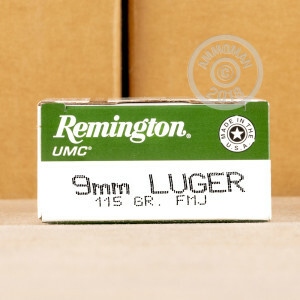 Remington manufactures UMC brand ammunition in Arkansas using non-corrosive Boxer primers and brass cases. Have only had 2 FTF's (over 250 rounds fired so far) one was a gun feeding issue (new pistol) the other (at inspection) the primer was struck and didn't fire. I would certainly order this ammo again! I didn't have any problems with the ammo at all. It came nicely boxed and arrived very quickly. I didn't have any jams or apparent problems with it and would recommend this website to my friends. Another great order. And fast shipping. Thanks Ammoman..
Ammoman has great prices and great ammo.